Hook a fun-filled trip for the whole family with one of the exciting programs provided below! $230.00 - up to 5 people for 2 hours. $100.00 (tax exempt) for an additional hour. Includes: Fishing equipment, rod, reel, artificial bait, 1 dozen live bait of shiners, and beverage for refreshments. Guests may not bring their own food, beverage, or coolers. A "catch & release" fishing trip on Village Lake which includes boat, driver, fishing equipment, and beverages for up to five people. Includes: Fishing equipment, rod, reel, artificial bait, and beverage for refreshments. Guests may not bring their own food, beverage, or coolers aboard. Guests may bring their own equipment, but the same rates will apply. $210.00 (tax exempt) for up to 5 people for 2 hours. Reservations: Required 24 hours in advance. Guests can contact (407) WDW-PLAY (407-939-7529), or any Walt Disney World Resort Guest Service location (8-285-6730). This is a catch and release program; Guests may bring their own camera. Fishing excursions may be cancelled due to inclement weather. Guests should arrive approximately 10-15 minutes prior to departure time. 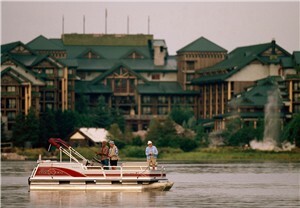 Reservations: Recreation Reservations Line at (407) WDW-PLAY (407-939-7529) or through any Walt Disney World Resort Guest Service location. $230.00 (tax exempt) for up to 5 people for 2 hours. Includes: A fishing guide, fishing equipment, boat and refreshments. Guests may not bring their own food, beverage, or coolers aboard. This is a catch and release program only. Call the Resort Recreation Reservation Center at (407) WDW-PLAY (407-939-7529) for reservations and information. Locations and Times: Pick up areas may vary - please call for hours and locations. Guests may not bring their own food, beverage, or coolers aboard. *Prices and details subject to change without notice.